What can I send to Bangladesh? What items are restricted? You might be spending an extended period in Bangladesh, as a tourist, a student or an aid worker. In this case, there will be numerous items that you need to bring along with you. But airlines can impose strict limitations on the amount of luggage you can bring. Why not send your luggage with Send My Bag to Bangladesh and so avoid restrictions and high prices from your airline, and create a much more pleasant travel experience at the same time? Students studying for their degree in Bangladesh or those spending a year abroad or gap year in Bangladesh can quickly set up home by shipping their possessions, including clothes, books and DVDs, with Send My Bag. If you are heading to see the cultural sights of Dhaka or going on a trek through the rainforest, or if you are moving to Bangladesh permanently, you can avoid lots of stress by sending your possessions with Send My Bag. With your belongings taken care of, your journey will become so much more enjoyable. It is such a relief not to have to drag bags onto unfamiliar public transport. Instead, Send My Bag will pick up your bags at home and deliver them to your final destination in Bangladesh. To discover more about sending luggage to Bangladesh, visit our ‘How it works’ page, or our ‘FAQs’. While golf isn’t a big sport in Bangladesh, there are 14 courses in the country, so you can still enjoy a round of golf while you are there. Dhaka has the country’s top-rated course ? Kurmitola Golf Club. Why not try this course while you are in Bangladesh using your own golf clubs by sending them with Send My Bag? Make sure you find out how best to prepare your golf clubs for transit by visiting Send My Bag's page on sending golf clubs. Away from the highly-populated cities, Bangladesh has quiet roads in beautiful scenery and is being touted as an excellent destination for cycling holidays. You don’t need to worry about locating a bike shop when you are there. You can simply ship your own bike to Bangladesh and enjoy using a bike that you know suits you well. Send My Bag can ship your bike for you ? all you need to do is take it apart and package it up, ready to be collected. To find out more about shipping your bike, read our bike shipping page, where you can learn how to best package your bike for safe transport. To facilitate your move to Bangladesh, you will need to do some research into international removals to Bangladesh in order to move all of your belongings. If you go for this option, make sure you choose a reputable removal company that you are completely happy with and ensure that all your items are carefully packaged so that they won’t get damaged along the way. If you fancy studying in Bangladesh, at one of the many higher education institutions there, you can easily send your possessions with Send My Bag, which allows you to bring so much more than you could fit within your airline’s baggage allowance – so all the books, writing materials and clothes you might need. You could even travel with hand luggage only and just ship everything else. Find out more about student shipping and how to receive your student discount by visiting our student removals page. Send My Bag can also send a parcel to Bangladesh for you, which is particularly handy if you only need to send a small number of items. Other people can use this service to send things to you in Bangladesh, such as Christmas or birthday gifts. Make sure that anyone who sends you items is aware of the rules in Bangladesh regarding both brand new items and personal effects (see below). Take a look at our information page on how to send a parcel, to find out what you can send with Send My Bag and how to package your items. When sending big bulky items, like a coffee table or armchair, to Bangladesh, you could use air freight. Air freight normally takes one to two days, which is quicker than sea freight shipping, but generally more expensive. You need to also factor in the cost of paying for a customs agent to handle customs clearance and getting your items to and from the airport, which means that costs could quickly mount up. If you send internationally by air freight to Bangladesh your items will likely arrive at one of the major international airports, such as Osmani, Shah Amanat or Hazrat Shahjalal. A cheaper alternative is sea freight or container shipping. Sea freight is also good for bulky items, like a sofa or dining table. You will still need to use the services of a customs agent and will need to sort out how to get your items to and from the ports, which means the cost could be more than expected. When using container shipping to Bangladesh your items will most likely arrive by ship at a major sea port, such as Chittagong. The owner of the shipped goods must be in Bangladesh at the time of customs clearance and items must arrive within 6 months of the owner’s arrival. There is no personal effects allowance and all shipments will be subject to the prevailing duties and taxes. The owner of the goods should be named as the shipper and receiver; the name must also match that on the passport used to clear the goods. Shipments with a value over $100 may take an additional 72hrs to process. Old or reconditioned electronics, computer accessories, computer parts and office equipment. Bangladesh’s capital City, Dhaka, has a wealth of tourist attractions on offer. 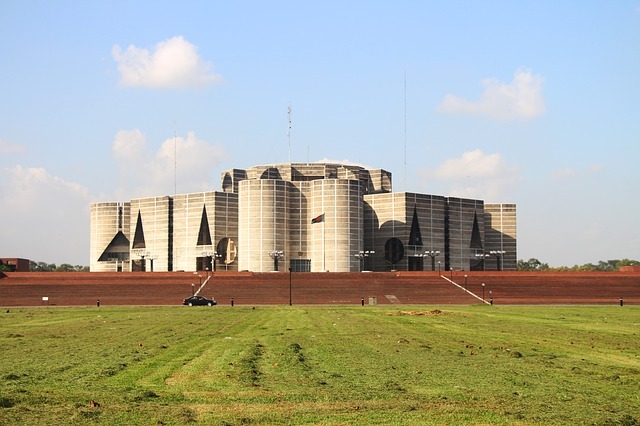 You can visit stunning modern-day architecture in the form of National Parliament House, or go back in time and visit Ahsan Manzil – the former residence of the Nawabs of Dhaka. Or why not take a tour of the 17th-century Lalbag Fort or Sonargaon, outside the city, which was once the capital of Bengal? If you want to view the Bangladeshi scenery, head to Cox’s Bazar Beach – said to be the world’s longest beach. It is beautifully peaceful if you can find a quiet spot away from the crowds. Or, visit the rainforest in Lowacherra National Park and do some wildlife spotting, where you are most likely to see monkeys and gibbons. Bangladesh has a subtropical monsoon climate, which means high temperatures and humidity throughout the year. The coolest month is January, when there is an average temperature of 18°C in Dhaka. The highest temperature is in August, with an average temperature of 29°C. Monsoon season is from May until September.